The highest point in Bolivia is Nevado Sajama, which sits at 6,542 meters. Bolivia's lowest point is Rio Paraguay. The official name is the Plurinational State of Bolivia. Bolivia's longest river is Mamore River. It is bordered to the north and east by Brazil, to the southeast by Paraguay, to the south by Argentina, to the southwest by Chile, and to the northwest by Peru. Official languages are Spanish and 36 indigenous languages. As of 1 January 2016, the population of Bolivia was estimated to be 10,809,544 people. With an area of 1,098,581 square kilometers (424,164 square miles), Bolivia is the world’s 28th-largest country, and the fifth largest country in South America. Bolivia has its constitutionally recognized capital in Sucre, while La Paz is the seat of government. Sucre was founded by the Spanish in the first half of the 16th century. Located in the south-central part of the country, Sucre lies at an elevation of 2,810 meters (9,214 feet). Agriculture in Bolivia includes soybeans, coffee, cocoa, cotton, sugarcane, corn, rice, potatoes and timber. Bolivia is one of two landlocked countries on the continent (the other being Paraguay), and Bolivia is more urban (67%) than rural (23%). The geography of the country exhibits a great variety of terrains and climates. Nevado Sajama is an extinct stratovolcano and the highest peak in Bolivia at 6,542 meters (21,463 feet) above sea level. Natural resources in Bolivia include tin, natural gas, petroleum, tungsten, zinc, gold, silver, lead and hydro-electric power. Bolivia has 10 national parks and 7 UNESCO World Heritage Sites. Noel Kempff Mercado National Park is one of the largest (1,523,000 hectares (3,763,414 acres)) and most intact parks in the Amazon Basin. With an altitudinal range of 200 meters (656 feet) to nearly 1,000 meters (3,280 feet), it is the site of a rich mosaic of habitat types from Cerrado savannah and forest to upland evergreen Amazonian forests. Major industry in Bolivia includes mining, petro-products, tobacco, clothing, handicrafts and food products. Lake Titicaca located on the border of Bolivia and Peru at an altitude of 3,812 meters (12,507 feet), is the highest commercially navigable body of water in the world. With a surface area of 9,064 square kilometers (3,500 square miles), it is larger than Puerto Rico and is South America’s second largest lake by surface area. There are salt formations in Bolivia that attract many tourists from all over the year. These salt flats are called Salar de Uyuni and they are the largest in the world. This area is often used to calibrate satellites because it creates a mirror during seasonal flooding periods. Bolivia has a rich folklore history full of traditions such as the 'devil dances'. They are one of South America's greatest folklore traditional events. Salar de Uyuni is the world’s largest salt flat at 10,582 square kilometers (4,086 square miles) in south-western Bolivia. The landscape is entirely flat, bar a few small ‘islands’ such as Isla Incahuasi, which only accentuates its surreal beauty. The main languages spoken in Bolivia include Spanish, Quechua and Aymara. In addition to these there are many more languages spoken by indigenous people and their descendants. Salar De Uyuni, turns into a mirror during the rainy season. Bolivia has about half of the world's lithium deposits and although the lithium deposits would increase Bolivia's economy, the Bolivian government protects it. The lithium deposits lie under the salt flats and the government does not want the area destroyed. Major ruins in Bolivia include the Iskanawaya, Inkallaqta, and Tiwanaku sites. Palacio de Sal (Spanish for “Palace of salt”) is a hotel built of salt blocks. It is located at the edge of Salar de Uyuni. Constructed in 2007, it was built with one million 35 centimeters (14-inch) blocks of salt which are used for the floor, walls, ceiling and furniture including beds, tables, chairs and sculptures. The monetary unit in Bolivia is the Boliviano. The population of Bolivia is more than 10 million. It has tripled in the last 50 years. Bolivia celebrates Independence Day on August 6th each year. Cristo de la Concordia (Christ of Peace) is a statue of Jesus Christ located atop San Pedro Hill, to the east of Cochabamba, Bolivia. It is accessible by cable car, or by climbing 2,000 steps. The statue is 34.20 meters (112.2 feet) tall, on a pedestal of 6.24 meters (20.5 feet), for a total height of 40.44 meters (132.7 feet). 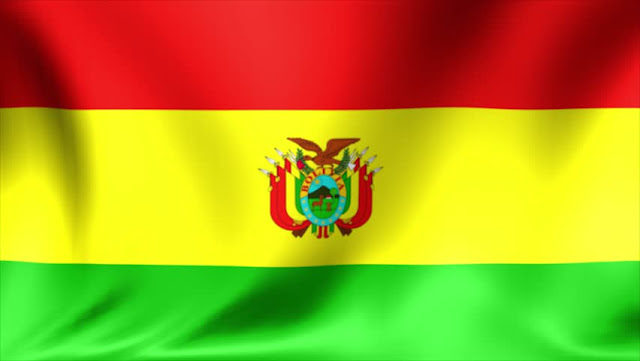 There have been approximately 200 coups since Bolivia gained its independence in 1825. El Alto at 4,150 meters (13,615 feet) has a population of 1,184,942, making it the highest large city in the world – ‘large’ being defined as a population greater than 100,000. Bolivia covers an area of land that is 418,683 square miles. The Witches’ Market, also known as El Mercado de las Brujas and La Hechiceria, is a popular tourist attraction located in Cerro Cumbre, a mountain clearing in La Paz, Bolivia. Merchandise sold in The Witches’ Market, run by local witch doctors known as yatiri, includes potions, dried frogs, medicinal plants like retama and armadillos used in Bolivian rituals. Bolivia's capital city is Sucre and its largest city is Santa Cruz de la Sierra. Cuy (guinea pig) is used and eaten as a traditional meat. It continues to be a major part of the diet in Bolivia, particularly in the Andes highlands as guinea pigs require much less room than traditional livestock and reproduce extremely quickly. The majority of Bolivians live in urban areas as opposed to rural areas. The name Bolivia comes from the Venezuelan military and political leader Simon Bolivar who led Venezuela, Ecuador, Bolivia, Peru and Colombia to independence from Spain in 1825. He was also officially the first president of Bolivia. Despite their name, the most significant exporter of Brazil nuts is not Brazil but Bolivia, where they are called nuez de Brasil. Bolivia's full name is the Republic of Bolivia or Estado Plurinacional de Bolivia. La Paz, Bolivia, was the first South American city to get an electricity supply. It was powered by llama dung. One of Bolivia’s oldest silver mines has claimed the lives of an estimated 8 million people in the past 500 years. It is known as the “Mountain that eats men” and is still mined with pick and shovel today. Cal Orcko, located 5 kilometers (3 miles) south of downtown Sucre in Bolivia, is home to the world’s largest and most diverse collection of dinosaur footprints from the Cretaceous Period. The limestone cliff hosts about 5,000 dinosaur footprints, with many dating back 68 million years. Bolivia's name was chosen because of Simon Bolivar, a leader during the Spanish American Wars of Independence. North Yungas Road also known as the “Road of Death” is the most dangerous road in the world. The Coca Museum (in Spanish, Museo de la Coca) covers the history of the coca plant from the Andean region and related drug cocaine. It is associated with the International Coca Research Institute (ICORI) in La Paz, the capital of Bolivia. A travelling version of the museum is available. Bolivia has experienced many problems in its recent history including widespread poverty, the illegal drug production and trade, as well as civil and social unrest. San Pedro prison is the largest prison in La Paz, Bolivia renowned for being a society within itself. Significantly different from most correctional facilities, inmates at San Pedro have jobs inside the community, buy or rent their accommodation, and often live with their families. The sale of cocaine base to visiting tourists gives those inside a significant income and an unusual amount of freedom within the prison walls. Elected leaders enforce the laws of the community, commonly through stabbing. The prison is home to approximately 1,500 inmates (not including the women and children that live inside the walls with their convicted husbands), with additional guests staying in the prison hotel. Approximately 95% of Bolivians are Roman Catholic, with the remainder being Protestant. There are also many spiritual religious traditions practiced by native residents of Bolivia.